This was a perfect room for us. Everything was near by and the room had everything we needed. Ronny the owner is very nice , would recommend his condo to friends. this unit is CLEAN, spacious, and quiet. Kitchen is well stocked, nice beach chairs and towels for our use. Bed was very comfortable. Its a great location to start in any direction to explore the island. One of the things we most enjoyed were the two pools, the beach with lounge chairs and the pavilion with covered eating and plenty of out door tables. Around dinner time, guests and residents gather to cook out, or share a cocktail, and watch the sun set. We especially enjoyed the gentlemen who came to blow the conch shell as the sun set. This place is wonderful if you just want to hang out all day, or come back to after a day exploring. We are planning to book our stay her for next year. Mahalo! Ronny, the condo owner, was very accommodating and quickly responded to our questions. Since the condo was newly renovated it was beautifully decorated. It had a well stocked kitchen with everything you could need to fix meals. It is a ground level unit which was convenient. We enjoyed the big walk -in shower. The king size bed and the Murphy bed were very comfortable. The grounds of this condo complex is very well maintained, and has a variety of tropical plants, grills, and two pools. It was so fun watching a great view of the sun going down each night. We would definitely return to this condo next time we come to Kona. I am slow at writing this review and even somewhat hesitant. Not because it is awful but because it is great! While staying here for a month, I tried to book this unit for next year but it is already taken! Just what I feared! This is the problem with finding such a gem. The condo is perfectly located a couple of miles from Kailua-Kona, yet near everything. This ground floor unit is perfectly located about halfway down to the ocean within the resort. You can hear the sound of the surf and a very short walk; one of the two pools is right next to the unit yet not noisy at all. Enough privacy on the lanai which even has a ceiling fan! The inside of the unit is spotless, and has everything a person can need. 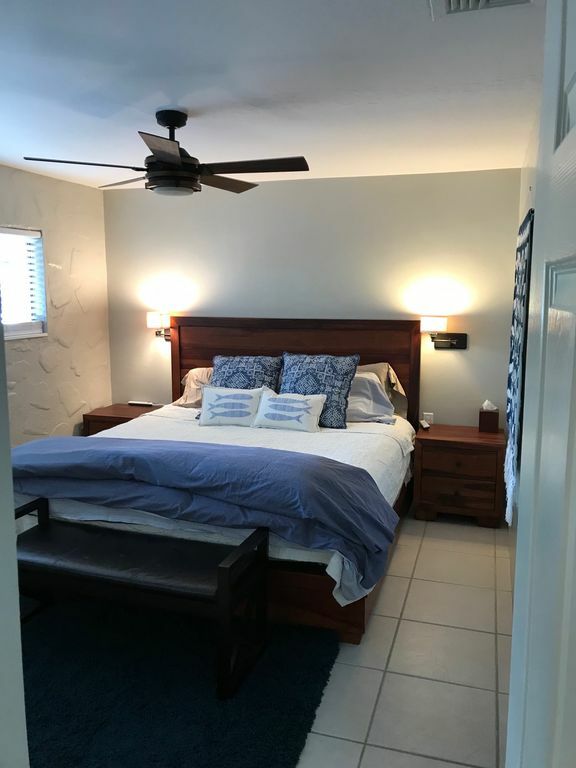 Some staple items in the kitchen and bath; walk-in shower and numerous towels; awesome bed; large TV with all the options; full kitchen; washer/dryer. My only complaint would be the parking, it is a free for all and a bit difficult finding a space close to the unit. As someone with a disability, sometimes the walk was a trial. A movable disabled placard that could be posted at a spot close to the unit would be very helpful. You can temporarily park near the unit while you unload items but you then have to find a vacant spot and walk. This is by far not my first vacation rental, but Ronny is the best landlord, is extremely helpful and ALWAYS there when you need him. I cannot thank him enough for everything. I will have to book way in advance but I hope to stay here again. We had a wonderful vacation. Loved the condo. Great pools and beautiful private beach. Condo is newly remodeled and pictures are exactly how condo looks. Loved the location. Close to downtown Kona and shopping and restaurants. Would definitely stay here again.